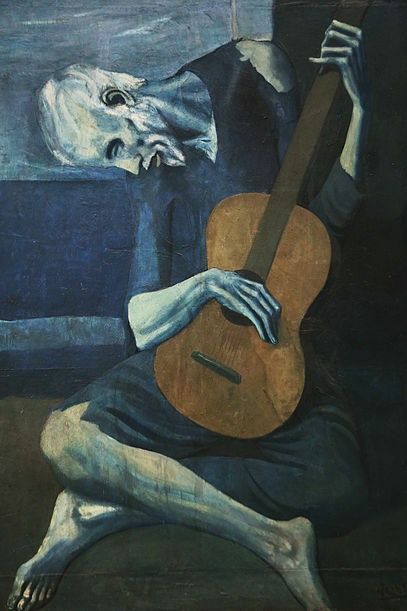 “The Old Guitarist” is probably the most iconic painting of Picasso’s “Blue Period” (approximately 1901-1904) when he was living in poverty and emotional turmoil. In addition to their obvious monochromatic blue palette, these works have an overall atmosphere of melancholy and seem to focus on poverty, desolation and isolation. The composition of “The Old Guitarist” is a significant shift from the contemporary Impressionism toward emotional Expressionism. I am struck by the unnaturalness of the old blind beggar. His legs are not correctly folded under him, his neck hang as if close to snapping off and his emaciated hands barely seem capable of holding the instrument. It’s a stark and powerful image but was only the final image finally painted on this particular canvas in 1903. Looking closely at the image above you can see the curve of a woman’s neck and jaw imbedded in the old man’s neck and then also two legs extending vertically through his shin. In 1998 conservators recollected higher resolution infrared and x-ray images to decipher what lay beneath. Research from the Art Institute of Chicago and a 2001 exhibit at the Cleveland Art Museum sought to decipher the under-painted images. The most obvious features include a woman’s head looking left, an outstretched arm with an open hand to the right and shins which (especially in the x-ray image) appear to be in a seated position. This is the well defined figure of a young woman. In the x-ray image there is another face at the young woman’s neck which looks to the right. Mary Mathews Gedo at the AIC connects this to a Picasso sketch dated 1902/03 now in Barcelona depicting a seated penitent old woman with arms outstretched. After even closer examination of the x-ray image, there appears to be the torso, feet and profile of a child nursing at the young woman’s left. William Robinson, Associate Curator of Paintings at the CMA, located a letter from March 1903 in which Picasso describes to a friend the same scene apparently here of mother and child with a bull and calf which can just barely be observed on the right of the painting. 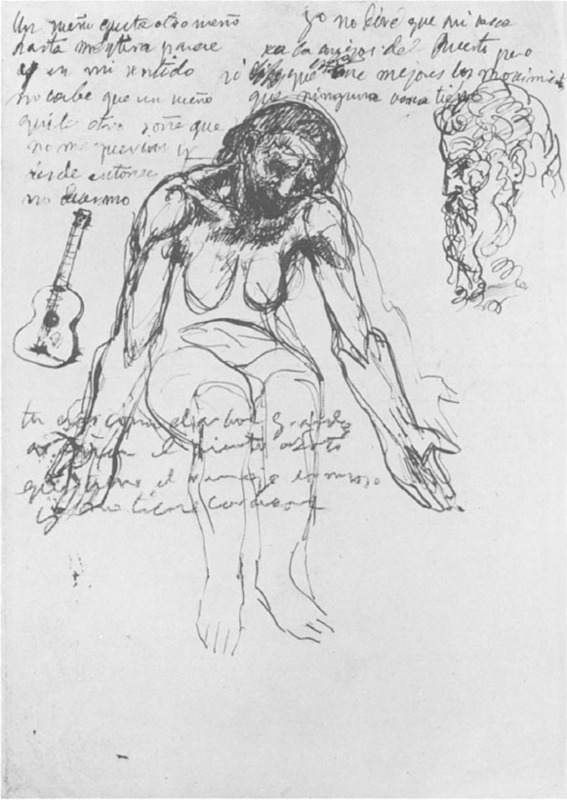 Likely preparatory drawing: Pablo Picasso “Figure, head and guitar” 1902/1903 (Museo Picasso, Barcelona). Reproduced from ref. 1. Since the IR and x-ray images detect not only outlines but the amount of paint applied to a canvas, I think we can made some inferences about the progression and timeline for the creation of these proposed pre-“Old Guitarist” images. 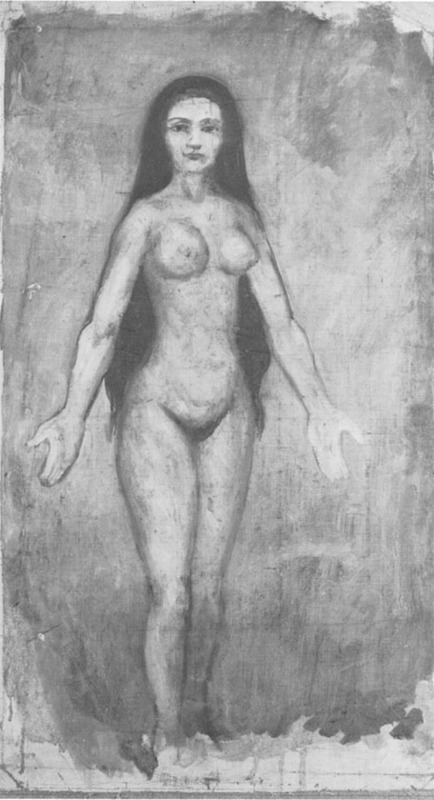 I think the earlier date (1902/1903) on the sketch of the old penitent woman is very convincing. This appears to be the original source material for the painting. However, the very minor outline of the head and missing evidence of her corresponding completed torso suggests that this design was altered almost immediately. The shoulders and arms of the upright woman are set higher than where the shoulder’s of the old woman would have been which indicates that the painting was heavily reworked just after beginning. 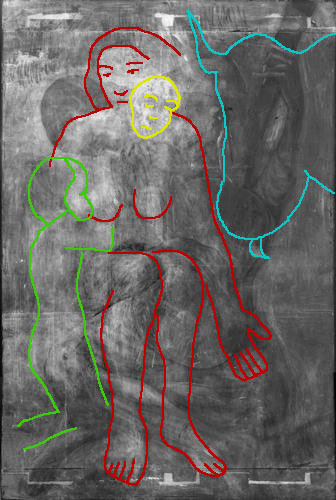 The heaviness of the upright woman’s head, torso and legs by IR and x-ray imaging indicates that work on this composition progressed very far. I think ultimately the bold face and posture of the woman seemed awkward seated in a chair and so the painting was discarded. 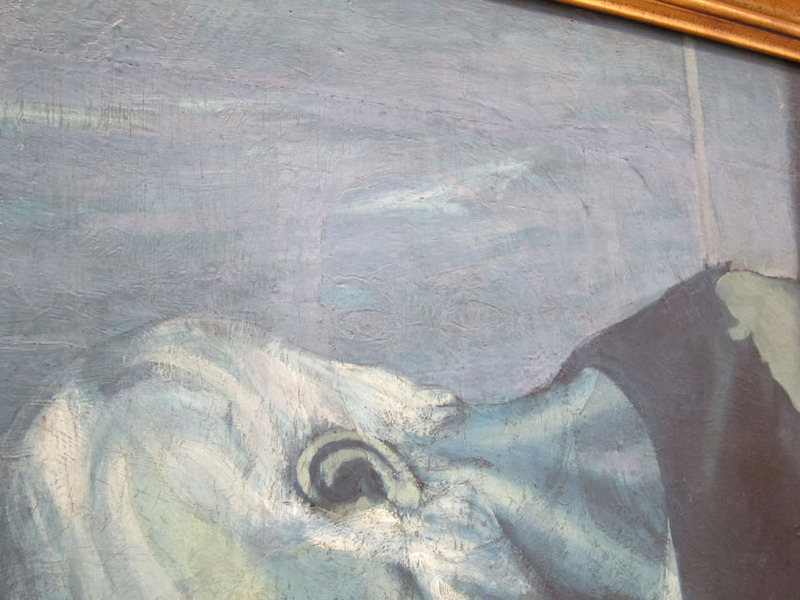 Picasso then went on to create the “Blue N ude” (1903) which is a very similar figure only now standing. In an attempt to save an expensive canvas, he may have returned to the seated woman and tried to incorporate a knelling child. Given the fainter outline and fill by x-ray analysis of the boy and the obliteration of the young woman’s left breast, I don’t think this image progressed to completion. At this point, the scene was abandoned and “The Old Guitarist” was painted over the canvas in 1903-1904. 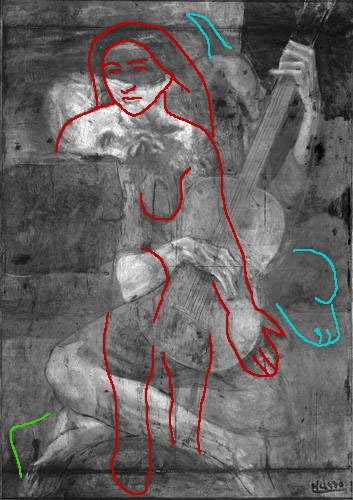 Similar figure to the over-painted young woman: Pablo Picasso’s “Blue N ude” 1903 (Museo Picasso, Barcelona) Reproduced from ref. 1. We can still see the remnants of the woman today because the blue period paints have faded. Picasso did not white-wash his canvas before starting a new composition while makes the effect even more intense now. While “The Old Guitarist” is a masterpiece, I find it even more interesting to follow how young Pablo Picasso composed and reworked his canvases. It is sometime the process that is just as interesting as the finished artwork. Mary Mathews Gedo, “A Youthful Genius Confronts His Destiny: Picasso’s ‘Old Guitarist’ in The Art Institute of Chicago” Art Institute of Chicago Museum Studies, 12(2), 1986, p. 152-165. Awwwwwwwesome! The painting on top is one of my favorites. I made a 3-D version for an art class. The old man was made of clay and my prof found him unrecognizable. Lesson learned: art is not my gift. you just gave me all of my answers for my year 7 art project on picassos blue period Thank youu!!!! !